Spring is finally here! It’s time to do some spring cleaning and get our dogs out and about to enjoy the fresh air. When you do your cleaning, don’t forget to take unwanted items like sheets, towels, blankets, and newspapers to your local animal shelter. Instead of throwing away clothes or brick-a-brack, bring them to a thrift store, or donate them to the Salvation Army. I’m all about reusing and recycling whatever I can. Remember, what is one man’s junk is another man’s treasure. In the past I’ve written about where and where not to get dog food, treats and toys. This month I’d like to spotlight a new location in our area that has truly caught my attention A few weeks ago two sisters from Georgetown, Carla and Nikki, emailed me (by the way, I love getting emails from people who read my column) about their new adventure in Georgetown: they are opening a dog boutique on May 1st called Under One Woof. This dog store is going to be the first and only type of retail store in town. As I’ve said in past articles, I’m against any food or treats that you can buy at your local grocery store. Instead, I encourage people to buy better quality foods at specialty pet stores, such as Under One Woof. The better ingredients may make for a more expensive food or treat, but trust me, it’s worth it in the long run…big time. I will highlight the ingredients in those cheap pet foods in a future article (I know I’ve already written about it before, but it’s such a huge issue it deserves another turn). So why should all you dog owners shop at this store? Besides the fact that it’s convenient, moderately priced, and has a great selection of food, treats and accessories, the owners are what will keep customers coming back for more. Carla and Nikki are full of smiles and energy, and are always eager to please pooches and their owners. When I first walked in the store I noticed how neatly organized it was. Everything had a place and was displayed nicely. The selection of food, treats, dishes, crates, travel bags, toys, spa and grooming items, bedding supplies, and collars and leashes is exceptional. This is truly a one stop shop for dog owners (there’s a limited amount of cat supplies as well). If you don’t see something that you would like, just ask and Carla and Nikki will do their best to get it for you. One of my favorite things was the big antique chest that was filled with tons of cool dog toys. I thought this was a different approach to displaying toys, and I really liked it (not to mention I loved the actual chest, it’s beautiful). I also loved the cute packaging for some of the treats. These will make adorable gifts for a birthday party, holiday party, or just a play date! In retail, packaging is key and I have a feeling these adorable treat packs are going to be a big hit. Another reason I like these girls is that they are pro-rescue and adoption. Anyone who supports adoption is on my “good” list. What immediately drew me to Carla and Nikki in their email was their suggestion to host adoption days at the store. I always jump at the opportunity when someone wants to help promote rescue and help us achieve our goal: to get dogs adopted and placed in their forever homes. Carla and Nikki are dog owners themselves and simply just love animals. Their vision is that by opening up the boutique to host adoption days, needy dogs can be showcased and hopefully adopted. They also offered to hang pictures of dogs that need homes on a cork board and also to put a donation jar on their counter…did I mention that I love these girls? I think this store is going to be a huge hit for Georgetown and the surrounding areas. A store can be great because of its contents, but if its employees are sub par, it will not survive. This is not the case for Under One Woof. This boutique has everything going for it. Better get there early during the holiday season, because those cute boxes of treats are definitely going to be a hot item. Please check out this store and support local small businesses. Under One Woof is located in the Eagle Building (next to Sedler’s Antiques) at 37 West Main Street Suite #4 Georgetown, MA. Contact them at 987-352-WOOF (9663) or underonewoof@verizon.net . And don’t forget to come by and take a look at dogs that are up for adoption on May 29th from 9 am-12 pm and take advantage of some great discounts! 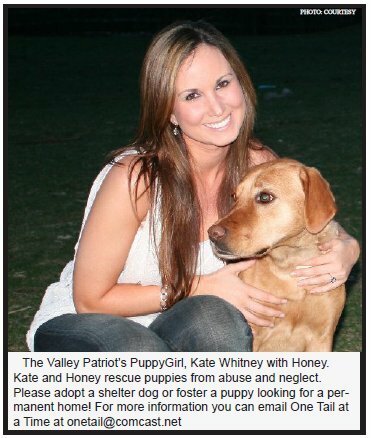 The Valley Patriot will be there taking pictures and supporting this event and of course Puppy Girl will be there. Come stop by and say hi! Hope to see you there! I also wanted to highlight a local restaurant and tell you about an amazing special that they have been running for a few months now. Evenfall Restaurant in Haverhill is giving customers two choices. When guests buy two dinner menu entrees, they can either take $10 off their bill, OR (the best option) they can tell Evenfall to donate $10 to One Tail at a Time Rescue. How amazing is this? I’ve always loved this restaurant, but I love it even more now that they are supporting dog rescue. So what are you waiting for? Head to Evenfall one night for dinner and support this great place and a great cause. Evenfall is located at 8 Knipe Road (Rt. 125) Haverhill on the N. Andover Line 978-521-7550.